This two storey, four bedroom family home is modelled on a traditional Queenslander style. Keeping with the traditional look, the front of the home is characterised by a high set facade with traditional Queenslander styling such as a two storey stairs entrance with a front porch. There are two carpark spaces (carport) drawn on the plan but no actual garage. You can enter the home either on the ground floor level near the carport area or the actual front formal entrance to the home is on the first floor. The ground floor of the floor plan consists of three bedrooms (all with built in wardrobes), a full size family bathroom, a fantastic kids retreat/second living room, the laundry, under-stairs storage and a great outdoor patio area. Coming up to the first floor you will enter into an open plan kitchen, dining and living area. The kitchen is of a modern design with plenty of bench space and a large walk in pantry. Situated behind the dining room you will find a dedicated study as well as a guest powder room. The master bedroom with its own private ensuite sits at the front of the first floor and features a gorgeous bay window. From the living room you have access to both the front porch at the front of the home as well as a massive rear deck area. 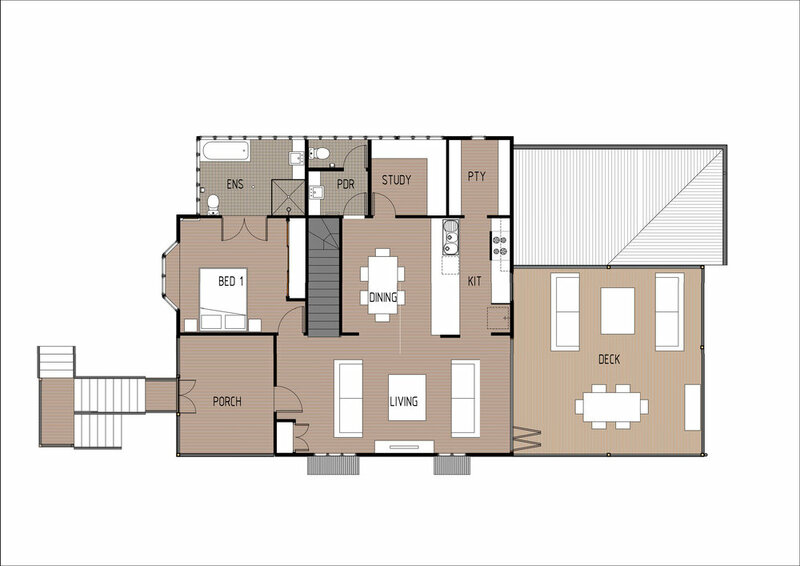 This floor plan is perfect for those who are looking for a modern touch on a traditional Queenslander home.